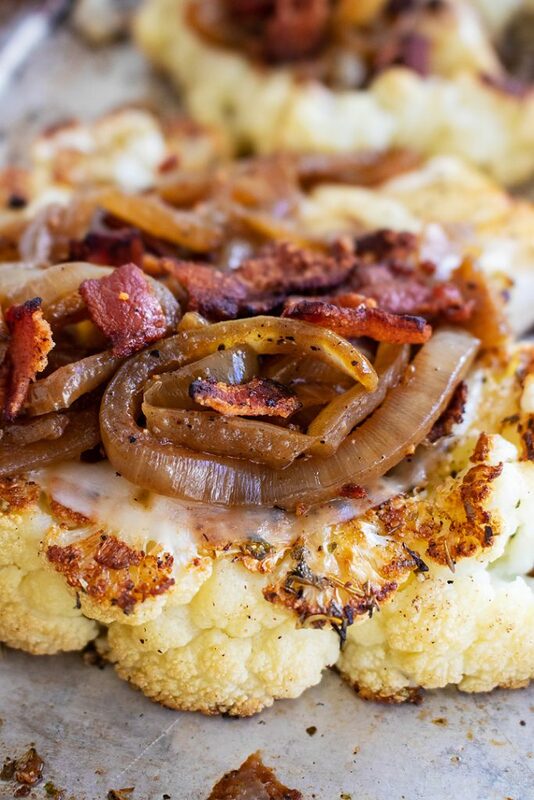 These are cauliflower steaks unlike ANY other! They are a great side dish packed with classic French onion soup flavors. 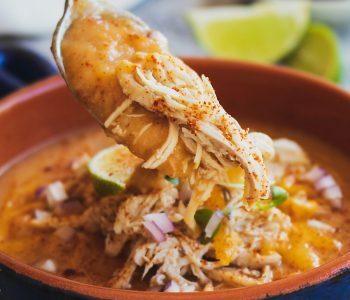 This is wonderful to serve along side any type of protein, but hearty enough to be eaten on its own. You will fall in love with their deep, rich flavor. Happy Wednesday friends! 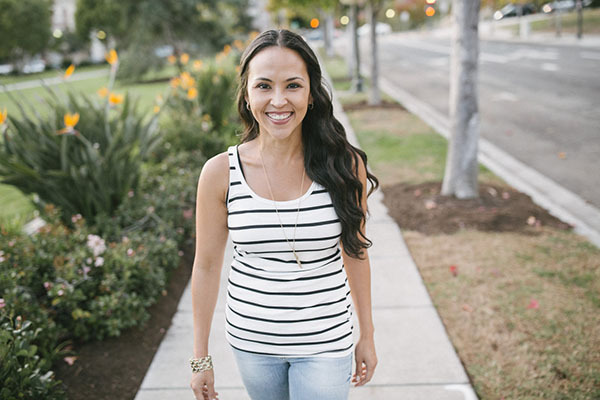 Today I’m sharing a new side dish that will knock your flavor socks off! These cauliflower steaks are so hearty and filling though, you could easily eat them as a small meal. They reheat beautifully (preferably under the broiler to crisp that bacon back up) so they can be prepared as a meal prep item. First thing you need to do for this recipe is crisp up your bacon. Don’t forget to reserve that bacon grease friends!!! Then get those onions browned and deliciously yummy! 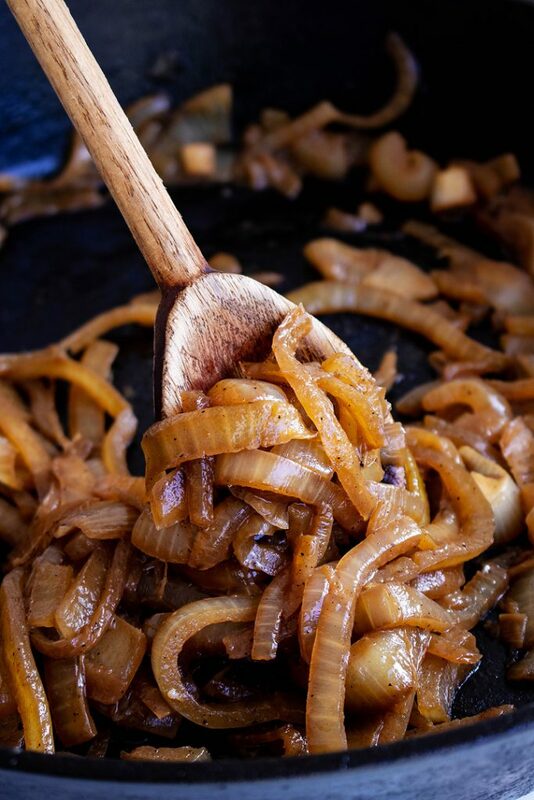 Traditional caramelized onions are cooked in a ton of butter (ain’t nothing wrong with that), but I actually found that I can cut some of those extra calories by at least half by simply using some water. Add a little butter to your pan (and bacon grease) along with the onions, some of the salt, and pepper. Continue to cook them under medium heat for at least 10-15 minutes. When it looks like the pan is getting a bit dry, add 3-4 tablespoons of water at a time in between stirring! 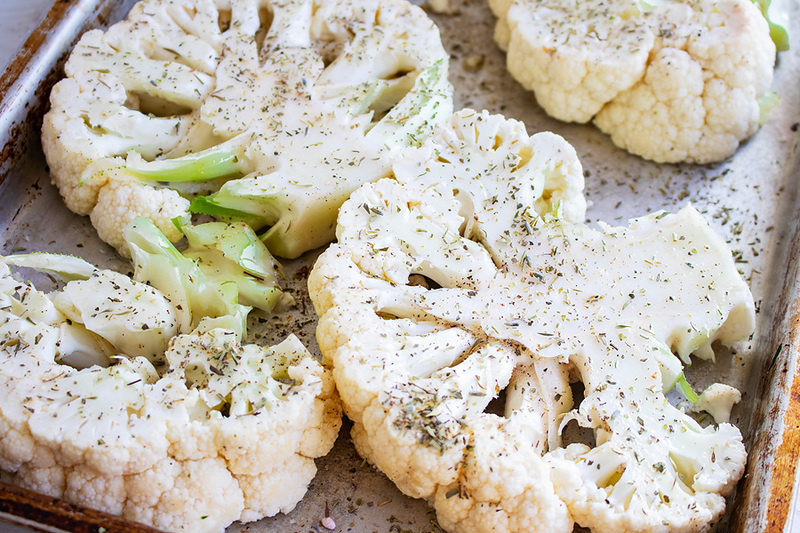 While the onions are cooking, get your cauliflower prepped and roasted off. 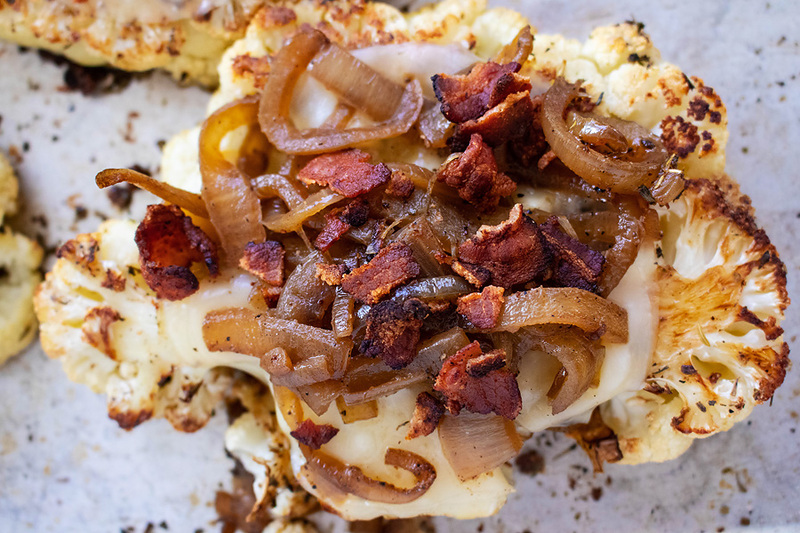 Because these are packed with so much flavor from the onions and bacon, the cauliflower itself really doesn’t need much. A little olive oil to brown it, dried thyme (or Herbs de Provence would work well here too), salt, and pepper. Easy. 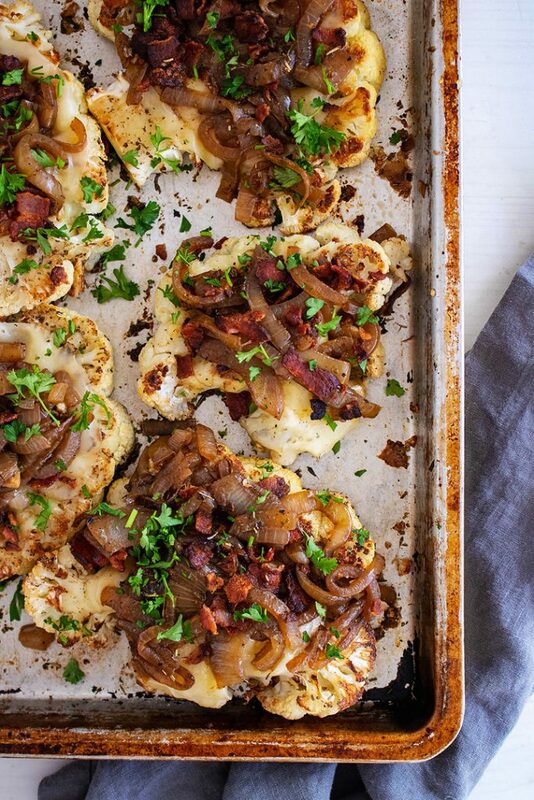 When the cauliflower is roasted off and onions are caramelized, the last thing to do is top the cauliflower steaks with cheese (omit or replace with a sliced nut cheese if dairy free), then the onions, andcrumbled bacon. Place this under the broiler until the cheese is melted and bubbling! Finish it off with some freshly chopped thyme or parsley. 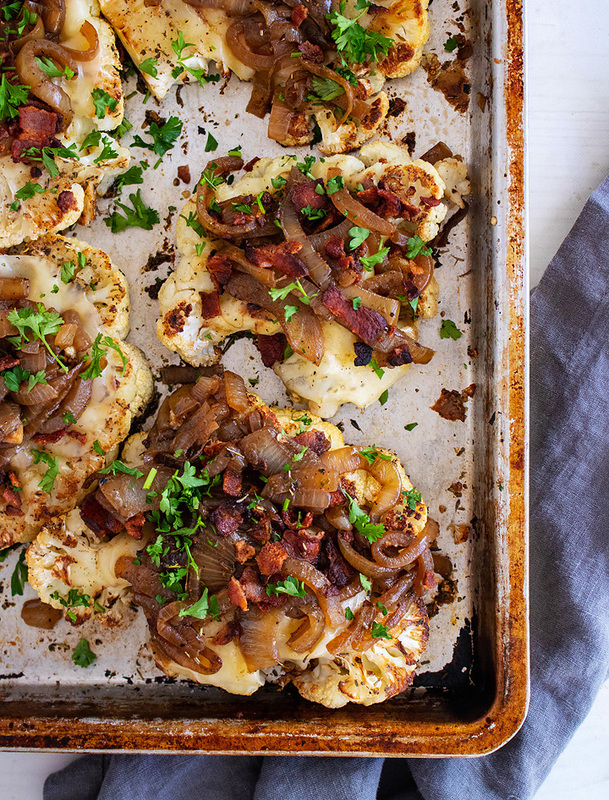 These cauliflower steaks are not only easy to make, but they are quite the show stopper as well. They look so beautiful and impressive. 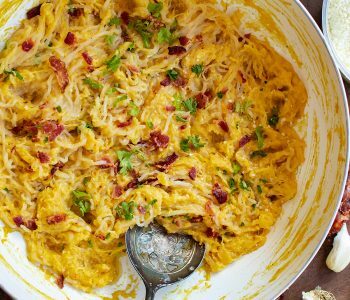 Everyone will ask you for this recipe after they devour their plates. 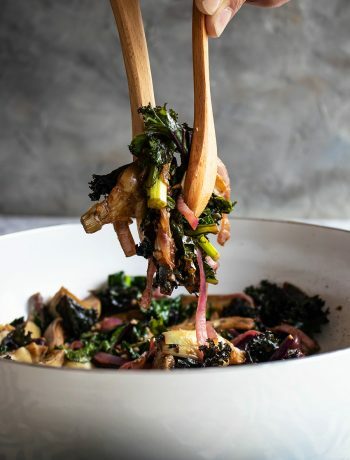 A great side dish packed with classic French onion soup flavors. 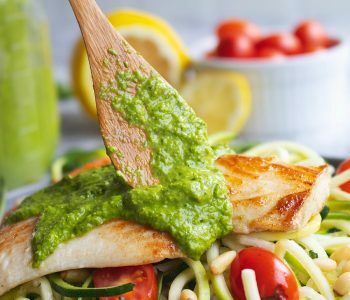 This is wonderful to serve along side any protein and hearty enough to be eaten on its own. Heat a large cast iron skillet set to low-medium heat and cook bacon until crispy, reserve grease. Add butter, onions, 1/2 teaspoon of salt, and 1/4 teaspoon of pepper. Stir well. Cook for 10-15 minutes until onions are browned and softened. Add 3-4 tablespoons of water to pan in between stirring to prevent onions from burning. When onions are done, preheat oven to 400° F and line a baking sheet with parchment paper. 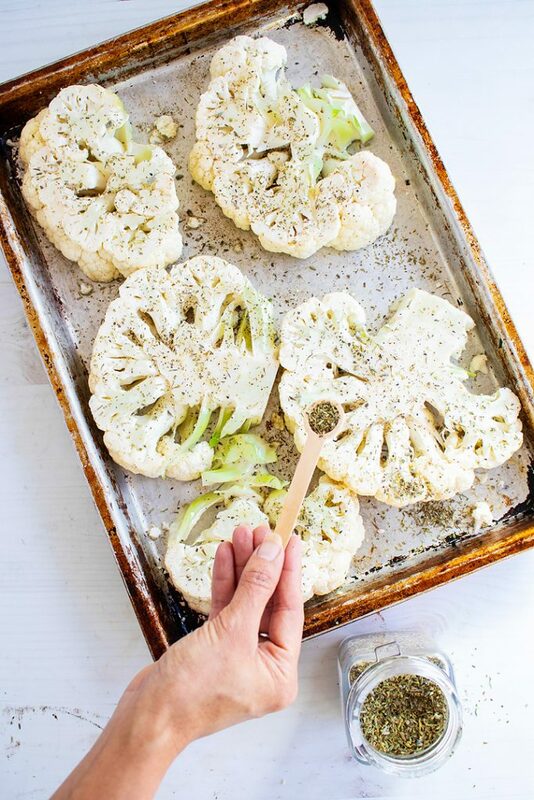 Lightly coat cauliflower steaks on both sides with olive oil, thyme, and remaining 1/2 teaspoon of salt and 1/4 teaspoon of pepper. Roast cauliflower steaks for 20-25 minutes until golden brown on the edges, turning once 1/2 way through. Remove from oven, add 1 slice of cheese to each steak, and top with prepared onions. Place under broiler for 2-3 minutes until cheese is golden brown and bubbly. Garnish with fresh parsley and fresh thyme if desired.